The Estate consists of 60 contemporary refurbished accommodation rooms, eight technology rich conference rooms, extensive breakout areas and a stunning restaurant leading to the kitchen garden. Our food is a big part of what we do at the Estate and we’re proud to showcase this. We are driven and inspired by strong values offering handmade, sustainable, local produce which is organic when possible. The Estate is a perfect venue for all corporate and social events, ranging from corporate conferences, special events, weddings, milestone birthdays and much more. 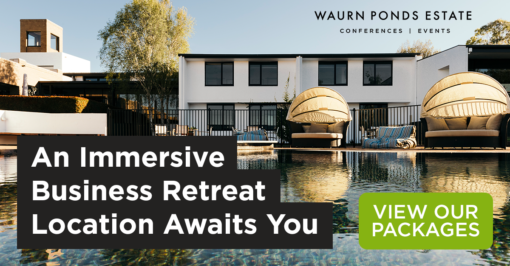 Tucked away on Deakin University’s Waurn Ponds Campus, the Estate is surrounded by a beautiful, distraction free rural environment with complimentary car parking. The Estate is approximately one hour drive from Melbourne and 30 minutes’ drive from Avalon Airport. Also offering an outdoor solar heated pool and spa, gymnasium, tennis courts and walking track to enjoy. For all of the latest news, informations, and specials sign up to our journal. The journal will contains helpful information on organising events, running conferences, as well as of all the latest recipes and innovations coming out of the Waurn Ponds Estate kitchen.